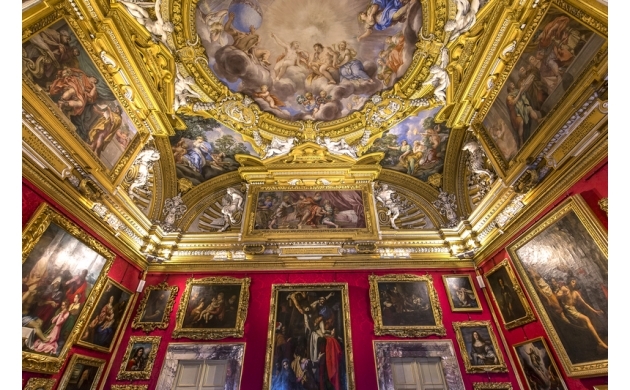 The Palatine Gallery is found inside the Palazzo Pitti, a building constructed by the Florentine banker Luca Pitti in a successful effort to create a residence larger than that built by the Medici family. The Gallery is host to over a thousand paintings from the 16th and 17th centuries, with a particular focus on the masterpieces of the Renaissance and florentine Mannerism. 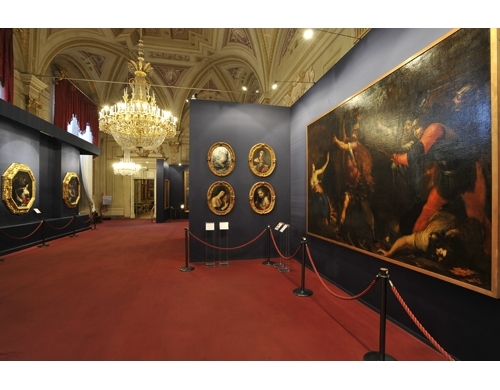 Among the many famous artists whose works are on display we can find: Raffaello, Rubens, Caravaggio and Tiziano. 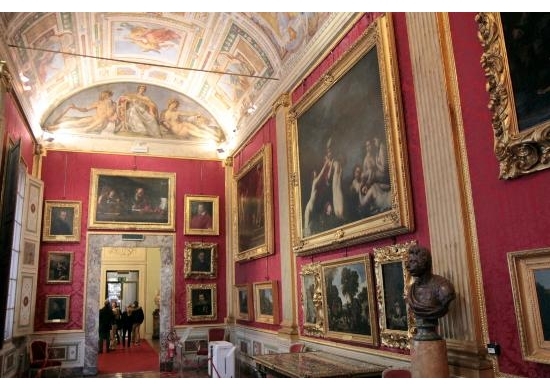 The collection of the works in the Gallery began in 1620 when Cosimo II de Medici decided to pick out a selection of art, based on his good taste alone, to be housed inside of the Palazzo Pitti. After Cosimo, and with the passing of the years, the selection continued to grow until sometime between the 18th and 19th centuries when a new structure was created within the Royal Apartments where the Medici family had originally lived. The Lorena family, who were responsible for this development, decided to install in this new space the masterpieces from the Medici collection, and in 1828 Leopoldo I di Lorena opened to the public the Royal Apartments. Thus was born the Palatine Gallery, otherwise known as the "galleria del palazzo". 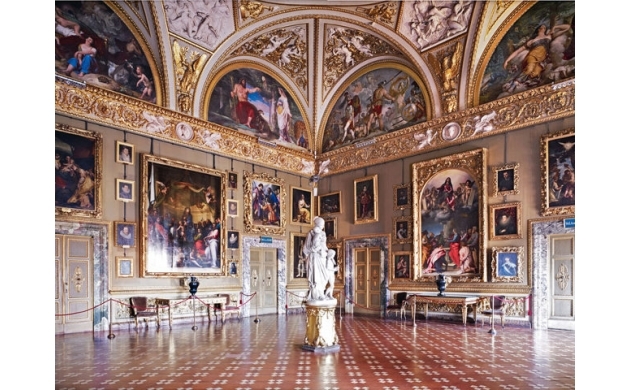 The Palatine Gallery is found on the first floor of the Palazzo Pitti, where one finds the most beautiful rooms of the entire building. Going up the big staircase of Ammannati, one arrives in the room where the Grand Duke lived with his family and where guests were welcomed. The room takes its name from the theme of the frescoes that decorated its vaults, or from the style which they represented. The frescoes in the first five rooms were created by the most celebrated painter of the age, Pietro da Cortona, while in the other rooms we find works from artists of the neoclassical period up through the first half of the nineteenth century. The Palatine Gallery is unique in the world due to the quality of its works as well as to its particular arrangement, in large part from the 19th century, that remains even today. Beneath the vaults decorated by Pietro da Cortona and by Volterrano, it is possible to observe the walls of the rooms completely covered in paintings, sculptures, and priceless furniture - such as the tables and cabinets with inlaid stones created by the Opificio delle Pietre Dure (literally, the Workshop of semi-precious stones). The layout of the works in particular is truly singular with respect to any other museum. It is a succession that does not go according to any time period or even style, but is entrusted instead to chance and above all the dimensions of the paintings. The Gallery, in short, born from the whims of the ruling families of Florence, was not intended to present a story though its artworks but rather was created to display a collection of masterpieces that would otherwise be inaccessible. The arrangement of the works, in fact, is governed by the characteristics of "quadrerie" (seventeenth century collections), which were defined by how the princes at the time of the baroque and enlightenment ages set up their own private collections of art. Paintings therefore were distributed close together in overlapping rows, and the determining element for the symmetry of the walls was actually the frames of the paintings themselves. In particular, the paintings that deal with religious and sacred themes, and which were initially created to embellish churches and then acquired by the Medici and the Lorena families, had to be readapted in size and in framing in order to be inserted organically into the collection. Inside the Palatine Gallery a place has also been found for works of art from the Medici and Grand Ducal collections which, for reasons of space, could not be housed in the Uffizi.